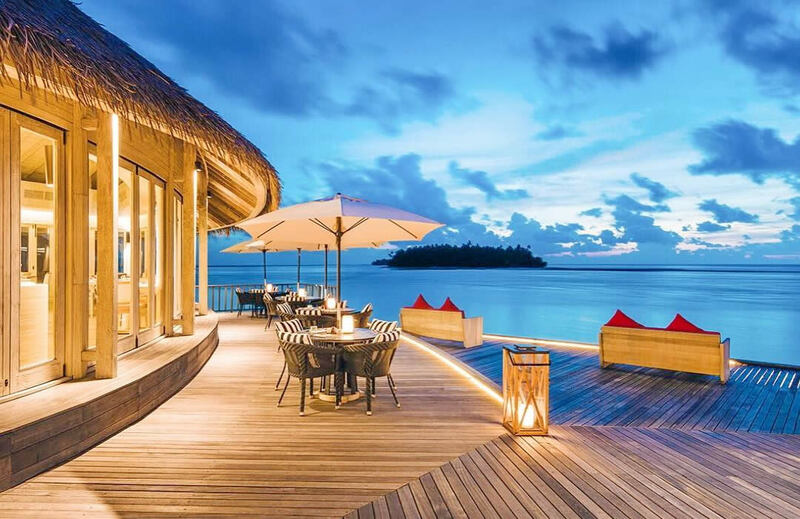 A beautiful pearl in the pristine corner of the Maldives, the magnificent Como Maalifushi is a state-of-the-art resort built for lovers of sun, spa and scuba diving. Slip into the blue from your water villa, explore the best coral reefs in the world or enjoy quality, first-class food at this luxury resort. 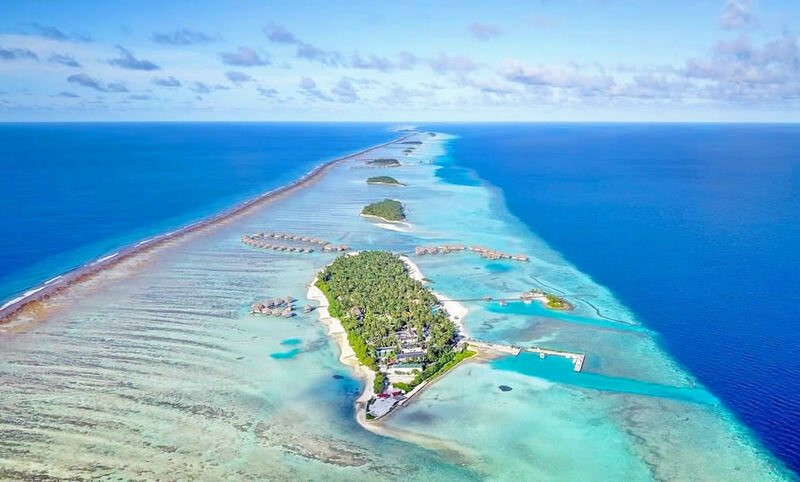 Maalifushi was the first luxury resort in the Maldives open at the remote Tha Atoll, and there are only a few resorts located in the far south. The sister resort of the more classy Cocoa Island, Maalifushi represents the style of the ecological brand COMO, following the refined luxury. Its design and atmosphere show the average between the minimalism of the Aman resorts and the ecological chic of Six Senses - a perfect place for a happy holiday. Maalifushi is more wild than some other islands in the more developed Maldives atolls. With a tall palm grove, wide beaches and natural healthy corals, it has a unique undiscovered feeling, so rare in our day. This is just one of the most uninhabited islets, whose green silhouettes are strung like beads one by one until the last one disappears in the sea haze. The nearest neighbor is an ideal emerald spot - and guests can easily swim there, or wade. Maalifushi is good for couples, but this resort unlike Cocoa Island, is more family friendly. In the menu of children's programs: a fun picnic on the beach, snorkeling excursions, exciting games, as well as a wonderful kids club. Nevertheless, Maalifushi is basically peace and tranquility, and the island itself is a serene place that you can only find. Yoga classes, luxury spa, fitness on the beach and healthy dining options are all components for the beauty of the body and the restoration of the mind. Maalifushi's ecological credentials are visible not only on paper: fruits and vegetables are grown in the resort garden and drinking water of very high quality; Gettiing around the island you can by bicycles, trishaws and electric cars, reducing carbon emissions to a minimum. 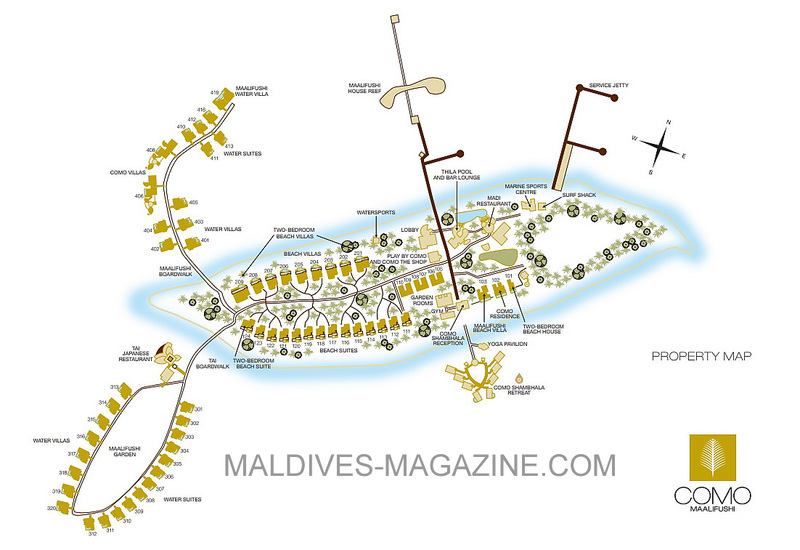 Maalifushi has 66 villas. 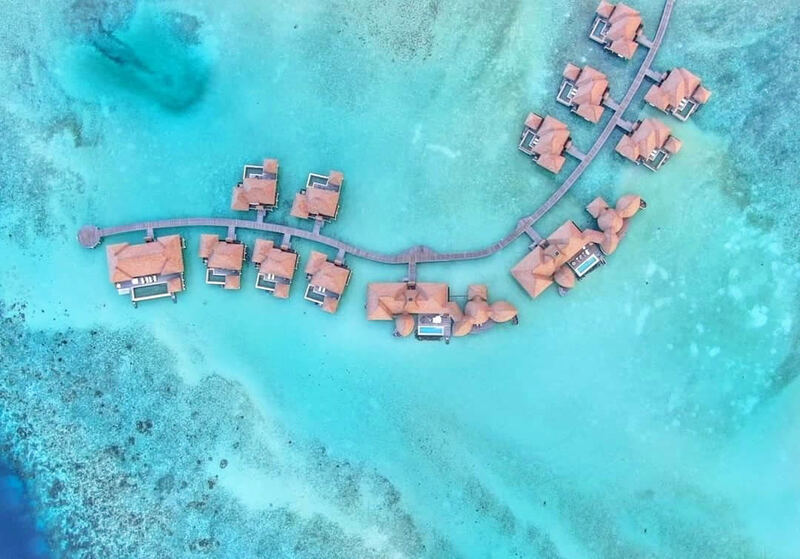 Half of the accommodation is a water villa (ideal for couples), the rest are located on the beach or in the garden - they are perfect for families with young children. All rooms offers privacy and luxury in a relaxed setting. The interiors are designed with wood floors and elegant furniture, and the beds are protected by anti-mosquito nets. Many guests prefer overwater suites and villas, painted in white, with a lot of sun light, with large sunbeds and thatched gazebo outside, and their infinity pools reflect the color of the lagoon and sky. It's hard to turn away from the Water Villas located on their own dock in the west of the island. Each key has its private pool, sun deck and large windows, giving you the opportunity to enjoy the best colors and music of the Indian Ocean. Baths is a recessed marble bath, large enough for two, marble floors and stone walls. There is also a shower in the open air, surrounded by wooden panels. Beach Villas are no less impressive; with a private pool, an open veranda, an open bathroom and french doors from floor to ceiling ... you will be surprised. COMO Villa: These 408m² two bedroom over-water villas are ideal for families or couples sharing. Complete with their own large private pool and sun deck, the large spacious rooms in these villas make for an ideal layout with a private butler service to ensure your every need is met. Maalifushi Water Villa: This 213m² villa is one of the most spectacular choices for accommodation at Maalifushi. It is very spacious with two large bedrooms and bathrooms with separate showers and bathtubs, making this a great choice for families or couples sharing. The light and bright villa is located at the very end of the jetty, allowing for peace and privacy with a totally undisturbed view of the Indian Ocean. The villa is complete with a private pool and sun deck. Housed under a nice thatched roof, open-sided, Madi is main restaurant, open all day, serves a palette of mouth-watering dishes from local, Mediterranean, Indonesian and Thai cuisine, drawing inspiration from the region's fresh produce and food from the sea. Overwater Tai restaurant (closed on Mondays, Wednesdays and Fridays) demonstrates Japanese culinary art on local seafood, with a generous assortment of sashimi and sushi, plus a fantastic list of cocktails ... sake too. Guests who take care of their health even on vacation can try Como Shambhala's dietary cooking; selection of raw, steamed and fried dishes, available in Madi, and included in the room service menu. Delicious drinks are offered near the swimming pool in Thila bar next to the Madi. There are many comfortable seats, low tables and board games. The family menu serves fresh salads, crispy pizzas and desserts accompanied by melodies selected by an experienced music concierge. Watch the children in the pool with a cold beer in your hand, or you can play Monopoly game, after a shot or two. Breakfast in Madi between 7:00 and 10:30. Cocktails at sunset are best between 17:00 and 19:00, do not miss dinner, which is served from 19:00 to 22:00. Almost everything on the Madi menu can be delivered to your room, including salads, sandwiches, pastas, and refreshing juices and lassi (service is available from 07:00 to 23:00, daily). Each table in Madi offers breathtaking views of the ocean, but the place on the edge is more popular. For an unforgettable culinary adventure, you can ask the staff to arrange a private breakfast with champagne, a private picnic on a desert island, or a romantic dinner at your villa. As well as the excellent family accommodation, the resort also has a fantastic Kids Club which has both indoor and outdoor play areas. For older children, there is a games room with TVs and a pool table. Children of all ages will find something to their liking in a large children's club, and there are also childcare services, a safe pool for families and many exciting children's programs and games that can attract younger guests. Water villas are not recommended for kids, it is better to choose a family suite on the beach. The source of eternal youth is Como Shambhala Spa that offers a range of traditional and modern Asian-inspired treatments including signature massages, facials and Ayurveda in eight overwater procedural rooms. Evaluate hot stone massage or Guinot Hydradermie Plus facial before practicing free yoga in an open pavilion. The lessons of meditation, pilates and bicycles are also all free. The resort is host to a Tropicsurf centre; the world-renowned surf school. Snorkelling, kayaking and paddle-boarding are all complimentary, and there are also three complimentary snorkelling boat trips per week. Water-skiing, wake-boarding and tube rides can be arranged at the dive centre, as well as a number of fun boat trips, including sunset dolphin cruises, sunset line fishing and game fishing. This means you can be as active or relaxed as you like during your stay, and there is something to enjoy for everyone. Guests can arrange beach picnics on a neighbouring deserted island, a real treat for families or honeymoon couples. In order not to spoil your holiday, do not delay the study of local sights on the last day. All the main adventures on the island are underwater and are managed by the resort. Imitating mermaids and "watery", guests can go in for private snorkeling, or order diving tours (from 110 US $ per dive), catch a wave at a local "break" or try your hand at sailing on a catamaran, kayaking and soup. In the menu of water sports center are the picnic tours to neighboring islands, excursions for watching dolphins, fishing or a cruise at sunset. In our opinion, COMO Maalifushi is the perfect combination of a relaxed atmosphere and reduced views at any time. Great for couples who are looking for peace and quiet...“Barefoot in paradise”, Fabulous, “Exceptional”... Best holiday we ever had. Amazing staff - everybody knew our name on the second day, fantastic facilities. It was such a delight to see my child playing with shells, driftwood and palm leaves! The perfect plastic-free holiday. No plastic bottles, no adds, everything was so subtle, so tasteful, in such harmony to nature. Diving center and the trips ( we did turtles, coral garden and house reef snorchelling) were amazing. Excellent service, nice and helpful staff, quickly responds to all requests. The staff is well-trained, despite the fact that the resort hotel is relatively young. Groves of tall coconut trees! Como has opened direct flights by seaplane from Male, and the flight will only take one hour. Most of the island is fenced, as an area for staff (the hotel employs about 300 people).